Click the button below to add the 4 Channel Real-Time DVR Security Camera System 1TB to your wish list. The kit KDA4-CARBZ4ZN-1TB includes a 4 CH H.264 standalone DVR and four night vision outdoor security cameras. All cables and power supplies are included. 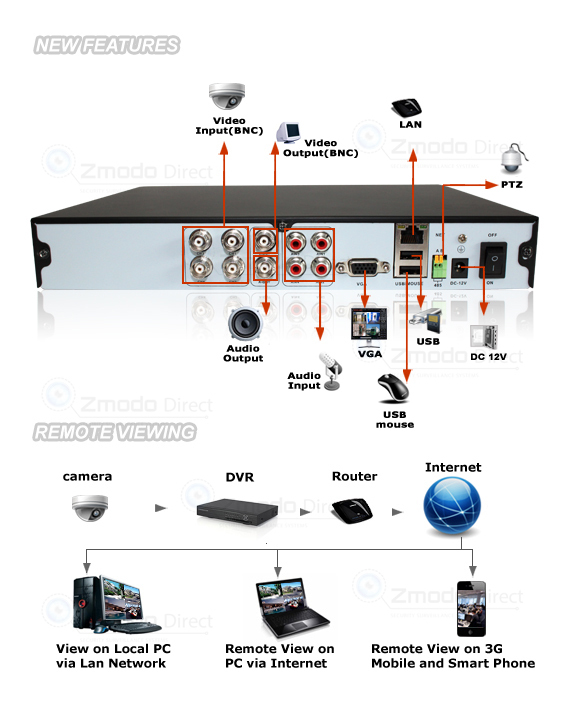 This 4 channel security DVR is a fully integrated, real time, and hardware based standalone digital video recorder. With video/audio input/output, motion detection, 3G live view, network access, PTZ camera control and USB2.0 backup, this 4CH security DVR is perfect for the home or small business. 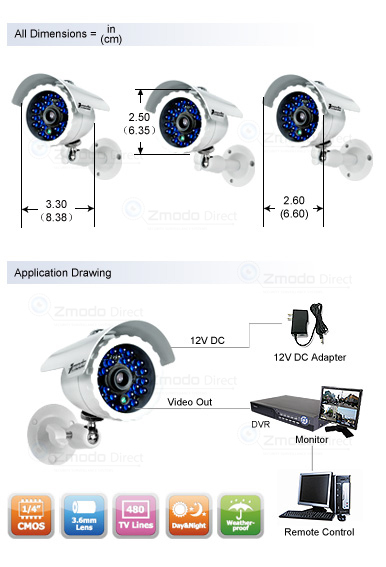 These outdoor CCTV cameras in the kit delivers crystal color video image in daylight, as well as black and white video in darkness up to 65ft away with 24 built in IR LEDS, which are perfect for outdoor and indoor application for driveways, parking lots, halls, warehouses, and open office areas. 4 Channels w/ 4 cameras - Great In-expensive starter kit. Weatherproof Cameras - Use the cameras indoors or outside. You really can't beat these prices! I am considering buying a second one for my son. The image quality is the best I've seen in this price range. 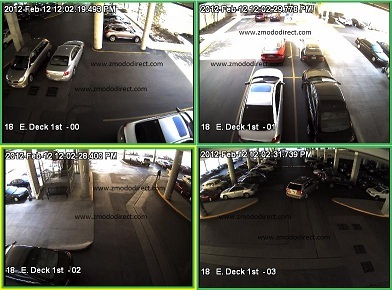 I highly recommend a Zmodo camera system to anyone who wants a high quality system at an affordable cost. I've been very happy with mine. With quick shipping I got in two days. Opened the box and it was very simple to hookup and use. hooking to the net was very simple with their online step by step insructions. Cameras are very clear. Good for the money. I've put in a lot of these systems, this one I got for home. The manuals could use more information. After reading it I thought I had to buy a hard drive to my shock. And I don't think this site sells a controller with alarm inputs, but the manual spend inordinate time telling you about them. I was confused. The day time color is ok for a CMOS cameras. You can get it to record on video motion detection, continuous, or alarm if they had that. I like ones that allow you to mix them. like record slow continuously but high speed and resolution when there are events. Their units don't allow that. That's a pretty easy software fix for them. On the positive side the video is clear, better than most. Adequate for ID of perpetrators. You can do all the network and cell phone stuff. I found the interface pretty straight forward. Price value on this unit is excellent, best I've seen. It will do the security job you're buying it for very well. Simple instructions comes with everything you need, just plug it into any VGA connection and its ready to rock and roll. I gave this unit a 5 star due to the fact that everything worked as advertised. I hooked it all up on the living room floor to test it out, what a snap. The instruction book was ok, not overly explanatory. If you have any knowledge of tv's, computers or setting up a vcr this is easy. The only hard part of setting up the system is running the cable. I used a staple gun to run the cables up under my eaves and actually stapled right thru the cable a few times and thought, oh no, got to get a new cable,,nope,,worked just fine. The night vision is not top of the line, but for the price it works fine if you tweak your camera settings. If you also have just a little bit of light it really helps out the night vision. In total darkness the infrared beam is kinda narrow and that's all you will see. but has the range specified. I have mine hooked to an old video monitor that had bnc connectors built in. Have not tried it on a computer via the vga yet. The colors aren't real great but again you can tweak your camera settings individually and get it looking good. You wont be reading a license plate but you can tell who people are at a good distance. Navigation of the system via the mouse is fairly straight forward and user friendly. All around I was pleased with the operation for $200 bucks. This is a good all around DIY for the home.